A Tailored that will fit you perfectly is a dream for everybody. We want to help you achieving that dream by creating your own Beige checked Blazer. We provide you with the design and you choose if you like it or if you want to change the details with our online configurator. This Tailored Beige is made of linen , a very breathable a thin fabric. This doesn't mean Linen is weak, it's actually a very strong fabric. This makes it perfect for the summer time and makes your durable and fresh. 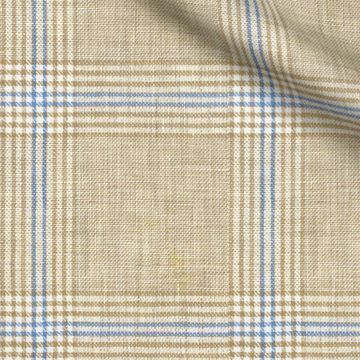 Your Beige checked Blazer would be completely made to your likings and measurements to make sure it fits you perfectly. Thanks to our high quality control and experience we can offer you a perfect fit guarantee. If you want to know more about our Perfect Fit Guarantee read here. The most casual option for pockets. Mainly used with linen or tweed and also with not so business fabrics. Perfect for casual events and relaxed situations.